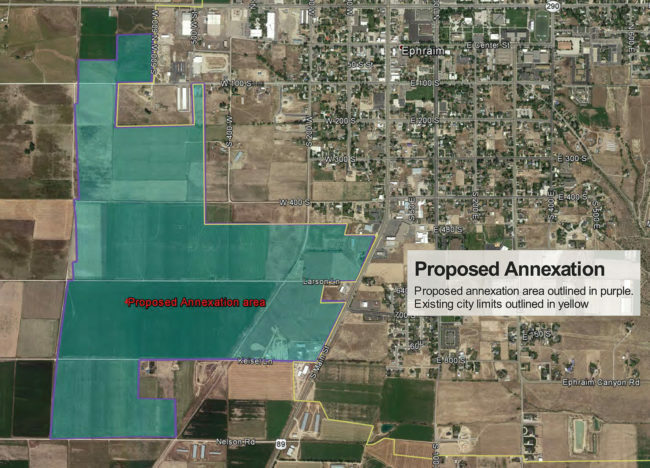 EPHRAIM—The Ephraim City Council is getting closer to a decision on the largest proposed annexation in at least a decade. The land involved is generally south and west of Hermansen’s Equipment and the city public works yard. If approved, the annexation would increase the geographic size of the city about 20 percent. More important, it could shape direction and location of city growth for decades to come. “In the long-term, this will definitely have an impact on how the city develops,” Bryan Kimball, the city planner, says. The original petitioners were Allen and Bonnie Keisel, owners of what was Seven States Recycling. But once the city received the petition, it started looking at whether the original, limited proposed annexation could be expanded. 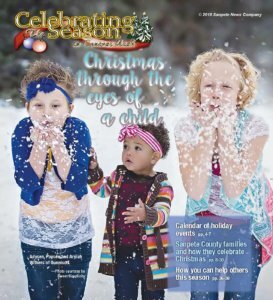 For one thing, the city had purchased land from the Keisels and located a new public works yard on the property. But the city’s own yard wasn’t in the city. Moreover, in 2008 and 2012, the city purchased about 100 acres in the same general area for future industrial growth. That land, too, was outside the city limits. The petition now before the city council takes in about 50 parcels owned by about 20 different landowners. The area in question is T-shaped. One arm of the “T” runs from U.S. 89 to about 450 West and from 450 South to 800 South. The longer arm of the “T” runs from about 450 West to 800 West and from 100 South to about 1000 South. The 400-plus-acre petition was complete back in March. But it had to be tweaked because, in its original formulation, it left behind a parcel that was surrounded by potential city land on three sides. It’s against state law for an annexation to leave behind “peninsulas.” One parcel was removed from the annexation map and another added in to square off the boundary. The majority of property owners in an area proposed for annexation must support being added to a city. In Ephraim’s case, most do, Kimball says. One of the owners who is opposed is receiving city utilities without paying city property taxes, Kimball says. And another owns property that is already half in the city. Kimball says the city council may deliberate for a couple of meetings before voting on the annexation. But he expects a decision no later than early January. City council approval would trigger a whole new do-list for Kimball and other city staff. The annexation petition and map have to go to the Lieutenant Governor’s Office, which submits them to several state agencies for comment. If there are no problems, the office will certify the addition of territory, and add the new boundaries to state records and maps. The city staff “has just started to dig out” all of the implications of the prospective change, Kimball says. For starters, the new land would have to be zoned. The city master plan already shows most of the 400 acres as a “growth area” for Ephraim. Kimball anticipates the land will mostly end up as commercial or industrial land. But the zoning is up to the Ephraim City Planning and Zoning Commission. There is sure to be a lot of discussion about how to provide city services, everything from culinary water to roads, Kimball says. Currently, some owners in the area proposed for annexation already get their electricity from Ephraim City. Others get it from Rocky Mountain Power. If the annexation passes, he says, people will continue to get power from their current providers until the city can negotiate terms for taking over the Rocky Mountain connections.